Lord Voldemort: Harry Potter, the boy who lived... come to die. So finally, after a decade’s worth of film, we have now reached the end of the Harry Potter movie franchise (minus potential spin-offs or whatever). This is a pretty major event as far as large film series go. Never has a major motion picture series managed to maintain all of the key actors for every major role as well as maintain a consistent level of quality all the way through. While some of the films are better than others, this is a rare feat to have seen be accomplished. Now, with the series finally coming to a close, one can only hope to relish in how aptly this film series manages to wrap itself up. This is certainly one of the best made films of the franchise, when accounting for several aspects such as the look of the film, the use of special effects, the acting, and for the most part, the film’s narrative drive to the finish. Upon reaching the end of the film, I cannot quite say that I felt the emotional resonance that has factored heavily into other well-beloved franchises, but this film does manage to do enough justice to conclude what has become quite the magical saga. As this is called “Part 2” for a reason, the film picks up literally where the last film left off. Harry Potter (Daniel Radcliffe) and his two best friends, Ron and Hermione (Rupert Grint and Emma Watson) are still in search of the remaining dark magical objects known as “Horcruxes”, which each contain a piece of the evil Lord Voldemort’s (Ralph Fiennes) soul. If the trio can locate and destroy the remaining Horcruxes, Voldemort will be vulnerable to attack and Harry will have a chance to kill him. Following the destruction of another Horcrux, which lead to an exciting and fun sequence of events, Voldemort does learn of the plan that Harry and his friends have in mind. Given that Harry’s next move is to find a Horcrux located within the walls of his school, Hogwarts, Voldemort and his minions launch an attack that will lead to the biggest battle of all of their lives. 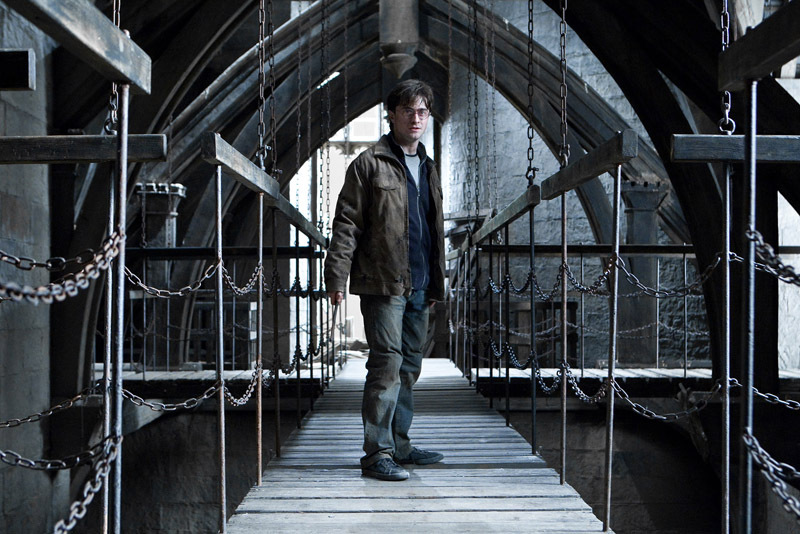 During this time, many revelations will be made, as Harry soon learns many past kept secrets involving those closest to him, as well as what his plight as “The Chosen One” may actually entail. It truly is an epic finale, as everyone seems to have chosen a side and life changing actions are going to either bring hope or be the end of us all. Flitwick: You do realize we can't keep out You-Know-Who indefinitely. Minerva McGonagall: That doesn't mean we can't delay him. And his name is Voldemort, so you might as well use it, he's going to try and kill you either way. As with “Part 1,” it should be important to note my exposure to this series. My thoughts can be summed up better in my review of the first half of this story, located HERE, but essentially – I did not read the books, but I have followed the films. Now, with that out of the way, it is also important to note that this series finale is not the film you want to seek out if you have not already seen the other films. As much as I believe that films should always stand on their own, this is the eighth film in a major movie franchise, which has a “Part 2” subtitle no less; one should definitely at least try to come into this film with some ideas in mind as to what lead up to this point in the story. I do think that there is enough in the basic storytelling to dictate what the basic stakes of this film are and how it functions as a film with a beginning, middle, and end; that being said, this film does not do too many favors to have you caught up on who these characters are or how the various magical elements of this world works in the film presented. This is a film that does require some initiative if one were to try and fully appreciate what it has to offer. It is funny how much preamble seems to go into actually describing these later Harry Potter films, before I actually get to my opinions, but now I will say that I certainly dug the film. I think it is at times excellent in the way it delivers so many satisfying things within the span of two hours and change. Endings can be very tricky, which has been the case in many third installments of a trilogy. Deathly Hallows Part 2 has the task of wrapping up all of the storylines that have come out of seven different films. It is a challenge indeed, but for the most part I appreciated so much of what this film managed to do. Starting with the actors, it has been a ridiculous journey in watching so many great British thespians join in on the Harry Potter film club, but we once again are treated to an assortment of actors, who all seem devoted to the task of delivering solid performances. To highlight a few, Ralph Fiennes is deliciously evil as Lord Voldemort, with Helena Bonham Carter right alongside him. Carter even gets a twist on her character, during a sequence in which Hermione becomes her imposter. Two other actors who may go woefully unsung in my opinion are Maggie Smith, as Professor McGonagall, who lends great credence to a small role, and Warwick Davis (yeah Willow! ), who actually stars in two roles, but excels as the untrustworthy goblin, Griphook. Most important, I feel, is Alan Rickman, who manages to finally justify so much of what has gone into his performance over the course of this series. I may be too quick to point to him as series MVP, but he is easily on the short list. The adult cast has always been given just enough to do, with the younger actors handling most of the weight, but there are some wonderful moments for many to shine. The young actors are another story, as we now see what is essentially the culmination of a decade’s worth of prep work. As it stands, the film is very much focused on Harry Potter, which may be less obvious than it sounds. Due to this, the film asks a lot from Radcliffe as an actor. It is a difficult task when you are placed in mono e mono scenes with the likes of Fiennes and Rickman, but for the most part Radcliffe does manage to hold his own. As for the rest, Grint and Watson are solid. This film does not focus much on deep character work (that’s what Part 1 was for), but a few are given some nice moments. Tom Felton actually impressed me quite a bit, as we learn the fate of Draco Malfoy, in what I feel is wholly appropriate for the series (especially after being a bit short changed in what should have been a more important arc in earlier films). Matthew Lewis was apparently given a couple 1Ups as well, for his character, Neville Longbottom, steps up to the plate this time around, which allows for some key, if overdone, moments. I could go on (Luna Lovegood has always been a favorite character of mine), but overall, it is a wonderful set of actors, which does a lot to fill this world with memorable characters. Neville Longbottom: You were right, never better. I feel like I can spit fire. 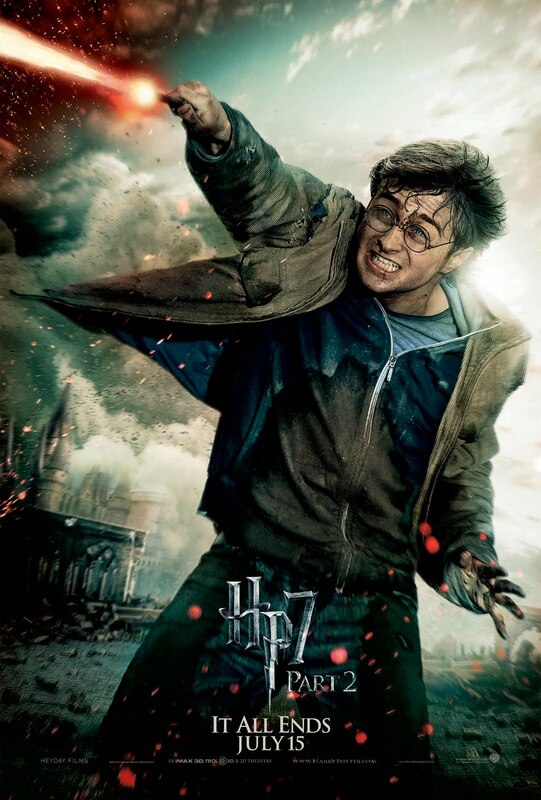 Director David Yates, who has only had previous Potter films to prepare him for a large scale finale such as this, does a pretty solid job at delivering a film filled with action, battles, despair, and humor as well. While this is rightly an emotional journey (especially for the book readers), as we watch these character for the last time, as they arrive at their ultimate fates, it should be pointed out that this film does have a sense of humor and much of the charm is still intact. I have always believed that if not for the likability of this cast of characters, this series would have died long ago. Yates has done well at creating an exciting film, although the journey does have some issues in trying to feel breathlessly paced. While there are moments that feel like a sprint to the finish line (which is unfortunate in some ways), the initial half of this film did not have quite the urgency it could have used. Exposition felt obvious and the lack of character work in favor of plot mechanics became an issue. Having literally watched Part 1, while standing in line for this film, I can say that I definitely appreciate that film more and may actually prefer it over this film. This brings me to the ultimate issue I have, which revolves around how effected I felt, as this film reached its ends credits. Ultimately, I felt satisfied with how everything turned out, but did not have the story’s conclusion resonate with me on a higher level. 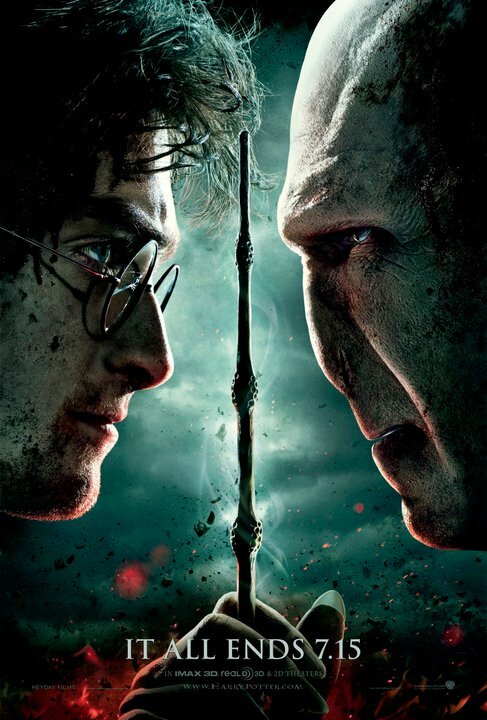 It may have to do with the final battle between Harry and Voldemort, which felt less like a struggle of good versus evil and more like a really cool way to show off a magic fight. There was also a rushed sense to it, making the end result feel like inevitability more than an earned triumph. This is one possible reason, but I would put more stock in my thoughts on the final epilogue of the film. This is a minor spoiler, but the film does have a time jump at the end, to show us a place where many of these characters are many years down the road. The simplest way to say it was that I got nothing out of this sequence. Aside from some interesting acknowledgements (there is a key character I have mentioned, whom I actually believe to be one of the most interesting of the series, now that it is over, (ask in comments, if truly interested)), I cannot say that I really felt for what this (fairly cheesy) sequence was trying to do. I must stress that just because the book did it, is not reason enough for me to feel like something should have mattered. Still, those above 250 words aside, this is a spectacular summer spectacle film all of the way. There are tons of individual sequences that standout, but I should put plenty of emphasis on how much great filmmaking is present here. The look of this film, the way it is shot, is wonderful. Cinematographer Eduardo Serra once again creates a beautiful film amidst all the fighting and darkness seen throughout. The visual effects work is superb and has come a long way since its shaky beginnings. And Alexandre Desplat’s score provides enough urgency to the proceedings, even when the film’s story balance feels a bit off. In a world that is currently seeing Transformers 3 stupefy audiences everywhere (I am one of them and I still enjoyed that film), Harry Potter has all of the right ingredients to make for a wonderfully successful blockbuster film that is aided by the support of skillful actors and the desire to maintain a high level of quality on almost all levels. I began by mentioning that Deathly Hallows Part 2 was a major movie event (which is why I have rattled on for so long) and it is true. This is the end to major movie franchise and fortunately, everything has come together to send this series off on a high note. While I would not claim this to be the best of the series, it is easily one of its strongest contenders. This has all been made possible by a group of what has to be thousands of people, who all have a strong bond with this series, and wanted to see it done right when all is said and done. Author J.K. Rowling has done a lot for the fantasy world and she should be proud that so many have done their part to create an epic fantasy film series that has loads of respect for her vision.